It's a lovely day of driving to visit Junhom Bantan, a social enterprise that works with cotton weavers in 2 small villages 100 kms south of Chiang Mai. Mindful of our carbon footprint, we usually travel by public transit when we can't go by rented motorbike. However, cotton products are bulky as well as heavy (not great on a motorbike) and the village is 20 kms beyond the junction where the bus stops, so we rent a car for the day. This allows us to also stop along the way at the Pa Da Cotton Textile Museum (to be covered in the next blog entry). Alleson recollects that the turn off the main highway is trickier than it appears on the map and, indeed, it is but we negotiate the further junction and head out the tertiary road through a dry scrub forest and look closely for the side road to the village. The turn-off is several kilometres further than we remember so we make a note for next time. Along this fourth road, stunted fruit trees are interspersed with stands of bamboo. The land is dry and rises gently towards one of the 5 chains of mountains that run north-south through Northern Thailand. It appears not well suited for rice farming despite the harvested fields that we also see. Four kilometres along, and well past the small corner store where we asked for directions last time, we pull up alongside a wall covered in vines, unsure where to go next. Happily, Mai appears out of a driveway to greet us; we've arrived despite feeling lost! We met Mai 2 visits ago and we've become more and more fond of each other with each visit. 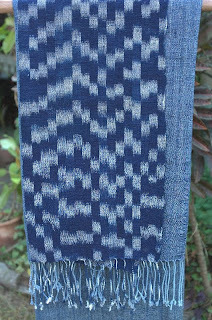 Her mother was one of the original members of the weaving group from which Junhom Bantan has evolved. The group was started 15 years ago with help from the government and the local branch of Homenet, an international organization that works with home-based workers. Mai now co-ordinates the re-conceived social enterprise. She develops new designs, manages finances and production and, most importantly, provides an important link to international markets that the group would otherwise be unable to reach. 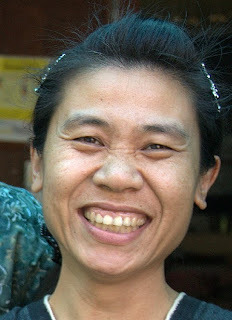 Like many Thai women of her generation, Mai was able to go to university, studying marketing; this was a feat for her parents, who, as farmers, struggled to raise enough money to supplement her small scholarship, with help from the income generated by the weaving and dyeing. As many studies have shown, when women, in particular, are able make money beyond a subsistence level, they put it towards their children's nutrition and education. Although she did go to university, and clearly has skills to show for it, Mai tells us that she prefers to live in the village where she grew up -- unlike many of her peers. During our visit she tells us that her father is a master dyer and that, in Ban Tan and the neighboring village, men do much of the heavy work of dyeing the cotton yarns, while a group of 40 women do the weaving. Our order of 124 pieces in 5 designs will take them 2 months to produce. This is "slow fashion" -- from the time needed for careful, handmade production to the timeless designs and the quality of the work that will help these pieces last. 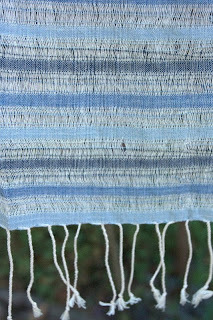 At the same time, most weavers prefer to use factory-produced cotton yarns for the warp (lengthwise yarns on the loom) because they are thinner yet stronger than handspun cotton yarns. This means that they are both easier to thread through the weaving comb as well as less likely to break during weaving. Each type of yarn has its own advantage. Handspun cotton yarns are very likely chemical-free and produce uniquely rich textures while machine spun cotton yarns are ideal for intricate patterns and can result in an especially lovely drape. Both have their place, and as our principal objective is to provide rural women with much-needed income, we purchase both. I asked Alleson to compare her ability to speak Thai with Mai's ability to speak English. She tells me that they are probably on par, although Alleson is practicing her Thai on a daily basis now, while Mai only has intermittent opportunities to practice. We were quite able to communicate, complimenting their spoken language with drawings and samples put together in small piles. I also photographed several scarves to keep a visual record of our order. 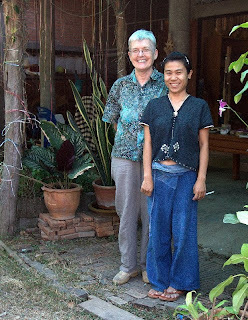 As we left, after spending the afternoon together discussing designs, placing our order, sharing stories about our countries, laughing and eating bananas that Mai brought from her garden, she invited us to stay with her in her village on our next trip. She will introduce us to some of the weavers and dyers, which we always love as this helps us tell their story better. Also, we'll take the bus next time, as Mai has offered to have us picked up at the junction. We can't wait!